Heat gas or charcoal grill. Cut 4 (18x14-inch) sheets of heavy-duty foil. Spray with cooking spray. In large bowl, mix lentils and water; soak 20 minutes. Stir in tomatoes, 3 tablespoons of the melted butter, the green onion whites, 1 teaspoon of the garam masala and 3/4 teaspoon of the salt. Brush chicken breasts with remaining 1 tablespoon melted butter; sprinkle with remaining 1/2 teaspoon garam masala, 1/2 teaspoon salt and the red pepper. 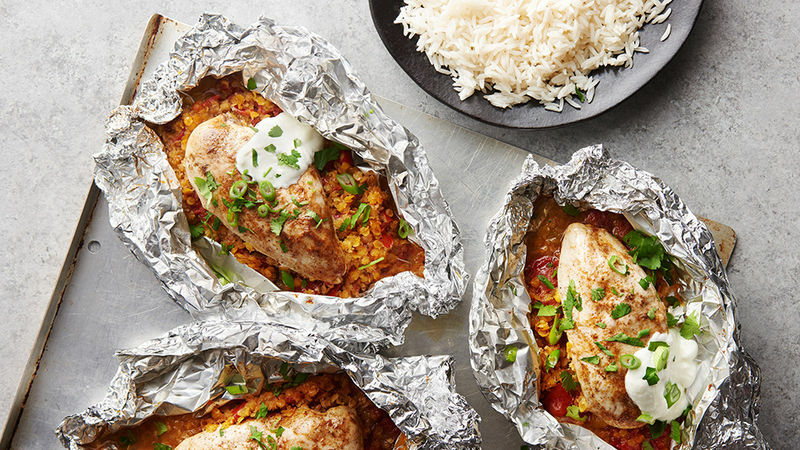 Pull up all 4 sides of each sheet of foil. Divide lentil mixture evenly among pieces of foil. Top with chicken breasts. Wrap foil securely around mixture. Pierce top of foil once or twice with fork to vent steam. Place packs on grill seam sides up over medium heat. Cover grill; cook 15 minutes. Rotate packs 1/2 turn; cook 10 to 15 minutes longer or until lentils are tender and juice of chicken is clear when center of thickest part is cut (at least 165°F). Remove packs from grill. Carefully fold back foil. Top with yogurt, cilantro and green onion greens. Serve over rice. No basmati rice? Jasmine is equally aromatic and flavorful, or plain white rice will do in a pinch as well. Do you order your take-out Indian food extra hot? Add an extra 1/4 teaspoon red pepper to the chicken.